This 8" Tac Force spring assisted folding knife is the perfect tool to carry around in your pocket. Featuring a sharp and durable half serrated stainless steel blade, this knife will get the job done. This 8" Tac Force spring assisted folding knife is the perfect tool to carry around in your pocket. Featuring a sharp and durable stainless steel blade, this knife will get the job done. The handle is also equipped with a glass breaker. This 8.5" Tac Force spring assisted folding knife is the perfect tool to carry around in your pocket. Featuring a sharp and durable half serrated stainless steel blade, this knife will get the job done. INCLUDES POCKET CLIP, BELT CUTTER AND GLASS BREAKER. BLACK PARTIALLY SERRATED BLADE WITH SILK PRINTING. 3.5" 3MM THICK BLADE, STAINLESS STEEL. BLACK ALUMINUM HANDLE WITH PURPLE LINER. Spring Assisted Knives. Z-Hunter Spring Assisted Folding Knife. Folding Knives. Knife Sharpeners & Accessories. 3.5" Stainless Steel Blade. 3mm Blade Thickness. Lanyard Hole. Pet Supplies. Tacforce Spring assisted Tactical rescue knife. Excellent quality knife with spring assisted features. Knife weight: 4.6oz (130gms). Spring Assist & Features: Glass Breaker. TAC-FORCE TF-736PE SPRING ASSISTED KNIFE. 3.25" 3MM THICK BLADE, STAINLESS STEEL. BLACK HALF SERRATED BLADE. INCLUDES POCKET CLIP, GLASS BREAKER AND SEAT BELT CUTTER. Snake Eye Tactical Action Assist Survival Pocket Knife. 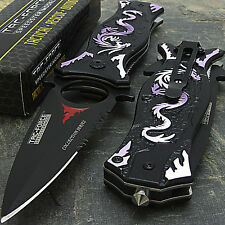 Purple Camouflage Designed Handle. All Black Half Serrated Stainless Steel Blade. SPRING ASSISTED KNIFE. BLACK STONEWASH HANDLE WITH PURPLE DRAGON. 3.5" 3MM THICK BLADE, STAINLESS STEEL. INCLUDES POCKET CLIP, BELT CUTTER AND GLASS BREAKER. Snake Eye Tactical Survival Action Assisted Knife. Purple Camo Designed Handle. All Black Stainless Steel Blade. 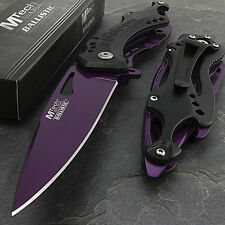 Mtech Ballistic Linerlock A/O Purple Knife MT-A705PE 4 3/4" closed. New 4 3/4" closed. 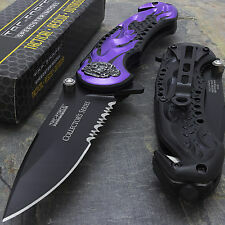 3 1/4" purple finish stainless standard edge assisted opening blade with thumb slot. Black composition handles. Snake Eye Tactical Rescue Style Pocket Knife. 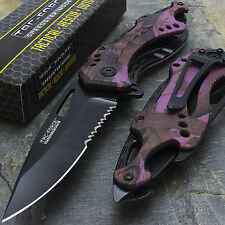 Purple Camouflage Design Handle. Includes Seat Belt Cutter & Pocket Clip. Z-Hunter Apocalypse Survivor A/O Purple Knife ZB-160PE 4 7/8" closed linerlock. New 4 7/8" closed linerlock. 3 1/4" black finish 440 stainless assisted opening partially serrated blade with sculpted skull on top edge, dual lashing holes and extended tang with lashing hole. 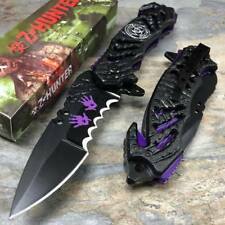 Blade features purple Zombie handprints. 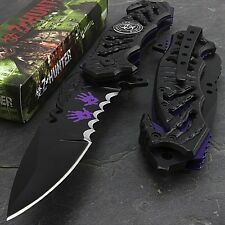 5 out of 5 stars - Z-Hunter Apocalypse Survivor A/O Purple Knife ZB-160PE 4 7/8" closed linerlock. 7 product ratings7 product ratings - Z-Hunter Apocalypse Survivor A/O Purple Knife ZB-160PE 4 7/8" closed linerlock. Tac Force Flaming Skull Speed Assisted Rescue Linerlock. 4 1/2" closed. Black finish 3 1/4" assisted opening stainless partially serrated blade with dual thumb studs and extended tang. Blade is etched Collector's Series. New Tac Force 4 1/2" closed linerlock. Black finish 3 1/4" assisted opening stainless partially serrated blade with dual thumb studs and extended tang. Blade is etched Collector's Series. Black finish aluminum handles with purple trim. Z HUNTER ZB-160PE SPRING ASSISTED KNIFE. INCLUDES POCKET CLIP, BELT CUTTER AND GLASS BREAKER. BLACK PARTIALLY SERRATED BLADE WITH SILK PRINTING. BLACK ALUMINUM HANDLE WITH PURPLE LINER. 3.5" 3MM THICK BLADE, STAINLESS STEEL. INCLUDES POCKET CLIP, BELT CUTTER AND GLASS BREAKER. Spring Assisted Knife. 3.5" 3MM THICK BLADE, STAINLESS STEEL.